I’ve been seeing a lot of extreme rosetail and feathertail bettas lately – and a lot of people admiring them. Their peacock-like tails make them beautiful fish to see, but at what cost? A lot of rosetail/feathertail betta admirers don’t realize that the excessive branching of the caudal fin (tail) on those beautiful fish has some very big downsides. Think twice before you stimulate these extremes by buying a fish like this or using it in your own lines! Rosetail and feathertail bettas are halfmoon bettas with extra branching in the fin rays (especially on the caudal fin). This allows the caudal fin to spread beyond 180° in some cases, causing it to overlap with the other fins. This makes for a gorgeous fish; the excessive branching gives the fins a rose-like, or, in extreme cases, feather-like appearance. Their beauty has made rosetails and feathertails increasingly commercially popular. Whereas at first they were mainly used by breeders to quickly improve the tail spread of their lines, they are now specifically bred to sell to the public on sites like Aquabid. And I have to agree, if I didn’t know better I’d definitely consider this tail types over others! Unfortunately, only paying attention to improving the finnage of a fish to create the ultimate X-factor rosetail will cause many problems for said fish later on. Why should this tail type be avoided? As discussed above, I would try to avoid buying rosetail and feathertail bettas. This especially goes for the more extreme versions. The fish you see in photos and videos are almost always still young and strong. Their fins are not fully grown in yet and they are not showing the various typical ‘rosetail-problems’. Lethargy. This one can also be seen in more extreme halfmoons, but is extra common with rosetails and feathertails. Their fins are so heavy the fish can’t swim for long periods of time and often spend most of their day sitting on plant leaves or on the bottom of the tank. Broken fin rays. Fin rays are the thin bones that hold the webbing of the fin together. Towards the end of the fin these rays spread out, which is called branching. Perfectly normal, except when the fish is bred so that the rays branch out much more than usual. The excessive branching causes a bigger tail, which in turn puts more weight on the rays. When the tail gets too heavy, the rays will not be able to hold the weight any more – they can break, causing the whole tail to collapse and damaging the fish. Once this happens, the beautiful rosetail/feathertail effect is usually gone; you’re left with a fish with collapsed fins that is often unable to swim properly. Tail biting. One thing leads to another; to decrease the weight of their fins and move more freely, a lot of rosetail and feathertail bettas start tail biting at some point in their lives. This habit, where the fish simply bites off parts of the caudal fin, increases the chance of fin rot. It’s very important to keep the aquarium very clean if you have a tail biting betta! Premature death. Most breeders agree that there is something wrong with the immune system in a lot of rosetail and feathertail bettas. They are weaker than regular bettas and often the smallest of the fry – because all the attention goes towards breeding the fish with the best finnage, other problems* are ignored. This can eventually lead to premature death, as the fish is more vulnerable to disease. *Ignoring imperfections just to focus on finnage can also lead to improper form or bad scaling, as showed in the video below. Note how the scales are not lined up like they’re supposed to be. 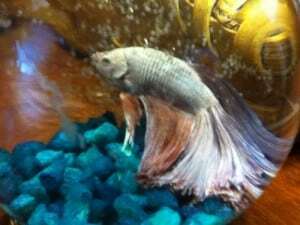 If you’ve already bought a rosetail or feathertail betta or rescued one, you may run into one or more of the problems mentioned above. Some fishkeepers choose to trim the tail of their extremely long-finned bettas, but this is not something I’d recommend. There are, however, a few things you can do to keep your fish comfortable. Baffle the filter is the flow seems bothersome, go for an aquarium that is long rather than tall and, most importantly, add plenty of resting places. Broad-leaved plants such as Anubias are perfect for this and will definitely be appreciated by tired and frustrated rosetails. You can also consider a Betta hammock. A good example of what can happen when a rosetail betta is no longer young and strong was e-mailed to me by Kenny, admin of Goodbetterbetta on Tumblr. She rescued a betta from a neglected tank, but it unfortunately turned out that the problems Columbus had stretched way beyond just those caused by the neglect. Columbus came to me as a rescue from an owner who hadn’t cleaned his tank in over a year (literally). (…) Columbus himself wasn’t in good shape, either. He was pale and skinny and never moved. He wouldn’t eat for a week. He must have been a feather or rose tail, but his fins were so blown out it was impossible to tell. The rays on his fins were all broken. His fins were ragged and lifeless and it was like he was just dragging a huge feather duster behind him. It limited his growth and he would tail-bite to reduce the weight, but it was never enough. He would sit there at the bottom of the tank, visibly miserable, or perch on the betta hammock I got for him so he could reach the surface to breathe more easily. Columbus right after being rescued. You can clearly see the collapsed rosetail here. It’s important to mention that of course not all rosetails and feathertails will end up like Columbus. There are examples out there of fish with the gene living a happy healthy life, but most of the time their quality of life just declines too much as they age. If you’re considering buying a rosetail betta, please think twice about it. Even if you don’t want to breed, you’re still encouraging the production of these extreme and harmful fin types. For more info on betta keeping, check out the Betta caresheet. If you’re looking for more examples of experiences with rosetails, be sure to scroll down to the comment section. Own a rosetail or feathertail betta yourself? Feel free to leave a comment and share your experience with them. Happy fishkeeping! what does a rosetail betta eat? I have a Rose tail I got from petsmart last year. Hes still going strong. I do not see any issues mentioned yet. Maybe some are subjected to bad breeding like breeds of dogs are. The result of this may be more pronounced in some compared to others. I doubt the issues mentioned effect every single Rose tail in existence. Glad to hear your rosetail is still doing well! Yes, the degree of bad breeding definitely varies and you can surely get lucky with a strong specimen. Whether you’d like to take the risk and support the breeding of fish that are so likely to struggle later in life is a question you’ll have to answer for yourself. hi. I also hear about HMPK (Halfmoon Plakat) species with bigger tail size than normal plakat. Is it gonna get the same problem like rosetail? Sure I dont want to buy a lethargic betta. So, should I buy HMPK or Normal PK? Hello! A halfmoon Plakat definitely isn’t going to have as much issues as a rosetail or even a normal halfmoon, because their tail is still much shorter. So no, I don’t think you would end up with a lethargic fish. Normal PK might still be a little better though because their tail likely has less branching. Thank you for sharing your insight. I just bought a Rosetail Betta recently and realised there is a big difference from normal Betta behaviour. I was suspicious that the heavy tail might be the cause. Your info confirms my thought. Lessons learned. Definitely won’t buy this tail type again next time. It is also sad to think that the selective breeding that we forced on animals for our own visual pleasure is causing them so much pain and suffering. I would like to see my Betta happy and living their lives the fullest. Not worth seeing them unhappy just to have a silly big tail for us. So sorry to hear you didn’t find this out before getting your rosetail. Hopefully the tips mentioned in the article can help make him comfortable! Lots of big leaved plants and gentle filter flow should be helpful. hi! I been thinking about get a Betta, and I want something like a Rosetail Betta, but I don’t want it to have problems 🙁 Is there a similar tail type that doesn’t have the shortest fins but not the longest fins? I really admire Rosetail Bettas but don’t want to support them either. So If you can find something similar to a Rosetail Betta I would love you! How about a star tailed betta? I didnt know about hear issues, I was looking around for a Betts with long luxurious fins but now I’m not, I saw a star tailed plakat and they look almost like regular plakat, is that the same? Will they have issues? Thanks for this article, we bought what I believe is a copper rosetail from a betta fish show, just because he had pretty colors, we couldn’t tell what fin type he was, and we were thinking about breeding him with a gorgeous copper crowntail girl we recently bought, just to see how it would go because they’re both copper, but since the rosetails have so many problems, I’ve decided we’ll instead breed the girl with one of our crowntail males instead. Thanks! Really informative. So glad to find this article. I found it after I started researching to learn what a feather tail betta actually is. Thanks for this. Thanks for the informative article and all the great comments! I’ve been babysitting a friend’s betta (i think it’s a veiltail) for 2 weeks, and when I mentioned to my cousin, he told me about the rosetail betta if I decided to get my own betta. I’m so glad I did more research and found this article. I definitely DO NOT want to buy rosetail now. I’m an animal lover, and it makes me sad to read about the issues rosetail bettas have because of their beautiful, long fins. I’ve never had an aquarium, so I still have much to learn/read before getting my own betta. Hi! So glad this article was helpful and steered you away from rosetails. I agree they are absolutely stunning but it’s just not worth it. If you do decide to get a Betta be sure to read plenty of guides and caresheets (the Betta tag) on Aquariadise might be a good place to start) to make sure you’re well-informed. I have a rosetail betta that i picked out from a petstore that I used to work in. He was young and was beautiful and I knew he would need extra care that most customers would not give him so I brough him home. I have had him for almost two years and he is perfectly happy and active. If you have one of these fish it is important that you do weekly water changes and make sure the water is the perfect condition for your fish to be happy. You also want to feed a high protein diet I would recommend getting fish food specifically for bettas or buying frozen food such as bloodworms or brine shrimp and feed these as a treat. Provide plenty of resting spots like betta hammocks closer to the top of the water line. Marimo Moss balls at the bottom. Also remember to avoid any sharp rocks or sharp hideouts or sharp artificial plants. A good rule of thumb is if it is sharp enough to Fray a pair of pantyhose then it is too sharp for your bettas fins. If your Betta begins to get open wounds on the fins I would immediately go and get a treatment. A good one that i use is melafix. It is tea tree oil based so if the dosage is properly followed it is not harmful to the tank’s enviornment. 🙂 happy fish keeping! Thanks for sharing your tips. I’m glad to hear your rosetail is doing well, although I still wouldn’t recommend people getting one as it just sustains the market. I also have to note that Melafix is not medication and can actually be toxic to Bettas! This will tell you more about it. Ive been suspicious of the beuatiful tail types of Betta for awhile now , admit that it is hard to resist them when seeing them in stores . I told my wife that id never buy another long fin Betta ever again, then find myself admiring another halfmoon koi only days later. I love the plakats ,they have lots of energy an lots of attitude an really enjoy them ,one of the best fish ive ever owned..but do Dumbo Plakat have issues.hoping the answear is no. I have a rose tail. I got him I think almost two years ago! He was so beautiful; sadly he no longer looks like a rosetail. I am desperatly trying to make his fins heal and not get to the point of body rot. I moved out a while ago, and my mom kept my fish because it was easier. I would still go over and clean their tanks. A few weeks ago, most of his finnage looked fine, except for his tail (which is normal). I decided his tail had gotten way too short, so I decided to bring him to where I live so I could medicate him. Within a few days of him being with me again ALLLLLL OF HIS FINS ARE SUPER SHORT. I think it may have to do with the water quality change. He went from living in well water, to town water. I do add conditioner, but I am wondering if it isn’t enough. Aw, I’m so sorry to hear your rosetail isn’t doing well. Do you know if it’s fin rot or fin biting? Fish with heavy finnage do often bite off their own fins out of frustration. Hey, I’ve been thinking about getting a Betta and the Plakat’s are healthier with their shorter tails as you’ve pointed out. But I would like to know about the Plakat crowntail line mixes. Their tails are just as short for the most part, but are their immune systems still weaker or is that only an effect of longer tails rather than crowned tails? Great to hear you’re considering a plakat. I think crowntail plakats are definitely much less of a problem than rosetails. Although any heavily selectively bred fish will be a little weaker, rosetails specifically are exceptionally weak for some reason – not just because of their heavy finnage, but also genetically. So a crowntail plakat is definitely a much better option. Thank you for your quick reply 8D Is it possible to find perhaps one that is more plakat than crowntail but still has the crowntail fin shape, even if only slightly? I want to make sure it’s as healthy as possible, if not I am perfectly content with a plakat, the colors are beautiful no matter what but i am very interested in the crowntail shape at the same time. I used to own Bettas when i was younger when my mom claimed they didn’t need filter or heater and could be kept in a vase with a plant that they could “feed” off of :/ I decided, now that I am older to actually do some research rather than just listening to the pet store workers and turns out it was all wrong! 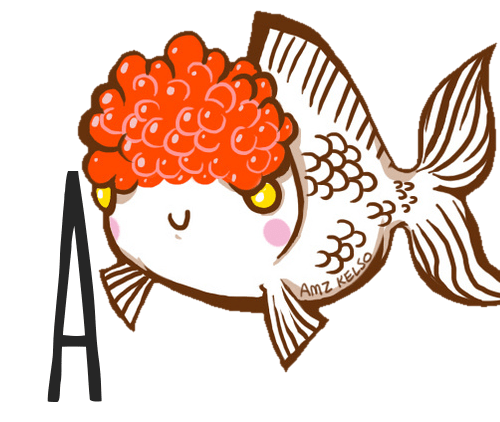 I feel aweful about those Bettas now so this time I’m going to make sure I do a…. Betta job? I’m a horrible pun making person 0-0; But yeah a 10 gal rather than my dinky little… 1.5 gal i think it was? Well regulated temperature all that jazz… I was seriously considering a rosetail for the very same reason many do, that long gorgeous tail… but upon just looking that up specifically i instantly found this and the shock i felt…. i almost made the same mistake all over again. Truly thank you for this I would have gotten one for sure if i hadn’t found out. Yeah, you should be able to find that, though you might have a little trouble locating such specific finnage in a regular pet-/aquarium store. I’ve seen plenty of plakats with slight crowntail characteristics at betta shows. I just got a beta from a petstore whom was labeled a rose petal male, and while he may be young as I have no grasp of how old he is, Casanova seems healthy even though he’s not one of my more energetic fish. His fins are even shorter than that of my half moon double tail but he rarely moves but stays more at the top of the tank. Should I be worried? I saw him and his tri coloration was so gorgeous I thought he’d make a wonderful breeding male but now I wonder if I should. If someone who is experienced could answer my post that would be nice. I’m a beginner at hobby breeding and I just want what’s best for my fish. Hi! Congrats on your betta. First off, as for breeding – no breeding with pet store Bettas please. You don’t know where they came from and what genes they carry. For breeding, try to purchase fish from other hobbyist breeders instead! And try to avoid rosetails when finding breeding stock. If he has relatively short fins he might be fine in the long run although there’s no way of being sure and I’d keep a close eye on him. As long as water values are good, filter flow isn’t too strong, there are no symptoms of disease and he has plenty of resting places I don’t think you need to worry at this time. Just try to find fish with less heavy finnage in the future! I had a Veiltail that could basically be called a Rosetail. He had an obsurd anount of finnage. After showing him to a friend who is a breeder of Hybrid Betta he told me that he was probably a combination of Veil and Rose tail. He said that someone probably got a female of one variety and she was spawned with the male of another variety. He could swim well and was highly active. His fins were not round as most Rose/Feather tails are. His fins were still sharply pointed as a normal Veiltails is but it was like he had extra…..Hmmmm…..Layers….He also didnt swim with them all flared out like Ive noticed Rose/Feather Tails do. He kept his fins pretty held together and swam very quickly and well. He even jumped out the tank from time to time trying to get to the bigger tank next to his where I had a group of females with other fish. I actually ended up javing him in that tank as he managed to jump into it one day while I was at work and didnt seem to bother with the females or any of the other fish. They never spawned though. I had a double filtration system because I had other fish in the tank and there needed to be more water flow for them. To be exact I had 4 female Betta, six tetra, two snake skins, a ghost knife, two needle nose eels, 4 koi/gold fish hybrids, a Leopard Spot Alge Eater, two snails, and then my male betta when he decided to hop tank and live with everyone….I jad him for so many years before he died….I think it was 4 or 5….I had him forever….And he didnt die from old age….My niece knocked him over while I was cleaning the tank and had him in a glass bowl….The bowl landed on him and broke his spine…He lived for almost 3 weeks despite the injury but eventually the damage got to him…Eventually my entire tank died out from old age….Im now starting up a new betta tank and plan to get a King Betta as I have always loved the large and beautiful breed but given my dedication to my eco tank I never got one. Now is a good time. Anyway, past that Imy breeder friend told me that Rose/Feather Tails are NOT Always Bred. Sometimes they happen as a genetic mistake and he says that the look is In Fact A Genetic MISTAKE That People Cultivated. That is why they usually die and have problems swimming and just living in general. As you know Betta with long fancy fins Are NOT Natural. In the Wild Betta fins are nowhere near as long as they are in the pet store variety. He told me that Veiltails are the closes to being wild out of the “Fancy” tailed Betta. He told me that there is alot of breed mixing going on in the breeder world and that people are screwing up the fish. This is what drove him to breed his own Betta for his family owned pet store. He sells….Odd Pets…..That his family breeds and cares for on their farm and he brings here in the city to sell. Hed been making some beautiful Betta so I may just get one from him though I know it wont be a King…Oh Well…Betta are beautiful in the end….I just hope people will stop finding the flaws in Rose/Feather Tails and Overly Finned Halfmoons and Deltas….The fish being happy and swimming freely around its home is what makes the Betta such a magnificent fish despite its tinier size. Lastly as far as cutting a Bettas fins, if the Betta is strong and Healthy You can do it but you have to be a professional at it.. They are MUCH Tinier than that Asian fish in the Youtube video. Their fins are MUCH more delicate and their Constitution is MUCH Weaker, ESPECIALLY The Fancier Ones As Most Have Been Bred To Have Recessive Traits Like Crazy Long Fins and that makes them have a weaker immune system. So Be Careful and get a professional. I know how to clip fins because I had a Koi/Hybrid whos fins got ridiculous if I didny clip them. Theyd get sucked into the filtration and get ripped off then hed get an infection from the trauma. So I started clipping his fins every month like clipping nails. Id place him in a recovery bowl for 3 days and then put him back in the main tank. Anyway, Happy Tank Keeping People!! Great article! I bought a gorgeously fluffy halfmoon from an independent shop awhile ago and he always has probelms with his fins including dorsal + caudal fin breaks and degredation I think is from tail biting. He is really ugly now haha. I bought a normal tail-sized betta not long after I got the first and he has never had any problems with his fins, also he looks much better and healthier than the fancy halfmoon. They are in virtually the same water conditions + same water change frequency. I do not regret buying the halfmoon because he still has a good quality of life but would not buy another. Hi I was wondering if I should be worried about my rosetail Rhaegal. His fins were in extremely bad condition when I got him but I saw his potential beauty. I have been successful in starting to heal and regrow his fins but after reading this I’m worried about his fins getting too big. Just FYI his fins didn’t have anything like described above, his fins looked like they had been cut into by something. Looked very human inflicted perhaps. Hi! Sorry to hear you had lots of trouble with your betta. Unless he starts getting visible issues, I wouldn’t worry too much. Please don’t support the breeding of rosetails by buying more in the future, though! Thank you so much for this informative post. I wish I had seen it 4 months ago when I purchased my first Betta. He is a rosetail and was absolutely stunning. I purchased him from a chain store because I fell in love with his fins and color. Now 4 months in, he’s currently in quarrantine being treated for his second bout of fin rot. 🙁 Next time I will be wiser! Glad this post was helpful to you in identifying the cause of your betta’s problems. So sorry to hear he’s not doing well, I’ve actually had problems with all types of long finned bettas, not just rosetails, so I definitely know what it’s like to have your fish in and out of quarantine constantly. Super frustrating! Hopefully he gets better soon. I’m so sad. I had no clue about rosetails. I bought a betta maybe 7 months ago, off of aquabid. A red rosetail who I now notice demonstrates everything you’ve mentioned. His tail is mangled from the biting, but he still has a lot of fin left, and noticeably struggles to swim to the top. He rests on the plant and columns I have in his tank. I’m not sure what to do, but keep the water levels low. Oh dear, I’m so so sorry to hear that. The best thing you can do I think is to keep him comfortable. Be sure to have lots of plants with big leaves like anubias and betta hammocks so he can rest near the surface. Baffle the filter if you haven’t already, but make sure the water stays very clean because the tail biting does leave him vulnerable to finrot. Keeping the water level low is also an option if nothing else works. Would that help the rose tail live a longer, happier life? Betta fins usually grow back as far as I know, at least they do when the fish has had fin rot. Also, they just shouldn’t be bred! If people stopped buying them the market would quickly disappear and breeders would stop breeding for excessive finnage. Yeah they shouldn’t be breed, but for the people who already have a rose tail, would cutting the finnage short in a fish urgery help it? I think that usually does more harm than good. I also think the fins may grow back like when the fish gets fin rot. Doing a “surgery” like this likely puts the fish at a huge risk of infection, even if the water is kept very clean. I’m not sure, though, as I’ve never read reports of it. Ok, thanks for your reply!!! Oh wow, thanks for this article! My first betta was, a halfmoon, was a rosetail from PetSmart and the second was a halfmoon with a large tail (not quite a rosetail) as well. I’ve still got them both, but let me say, I see a HUGE difference in activity level! First of all, both fish had CONSTANT issues with fin rot. At first I didn’t know what I was doing with my bettas, had them in tiny 2.5G tanks, and didn’t know how to properly take care of the water. Fast forward several month with both in a divided and cycled 10G, and my inexperience had permanently damaged one of the fish. Both nearly lost all of their tails and while both have their tails growing/grown back splendidly, the rosetail’s fins just don’t look right. It’s getting better, but the other halfmoon was almost much more active. At this point, because the rosetail had a harder time growing his fins back, his tail is smaller than the other fish. The thing I noticed? He’s much more active than he used to be, though still not as much as the other fish. Thanks for sharing your experience! I’ll refer to your comment in the article, it’s definitely worth the read for anyone considering a rosetail. So sorry to hear you’ve had so much trouble with rosetails, this is just exactly what I meant. If you do ever get another betta, I’d totally recommend going for a plakat. I will be doing the same, as I’ve had nothing but trouble with ANYTHING long-finned! HAHA, wow, I hadn’t even noticed that! Apparently the rosetail breeder whose videos I used also likes to show off his chest… will replace that one by another video. My goodness!